The value and versatility of the modest tortilla/ tortilla chip can not be underestimated. The tortilla and tortilla chip can be used in innumerable combinations. 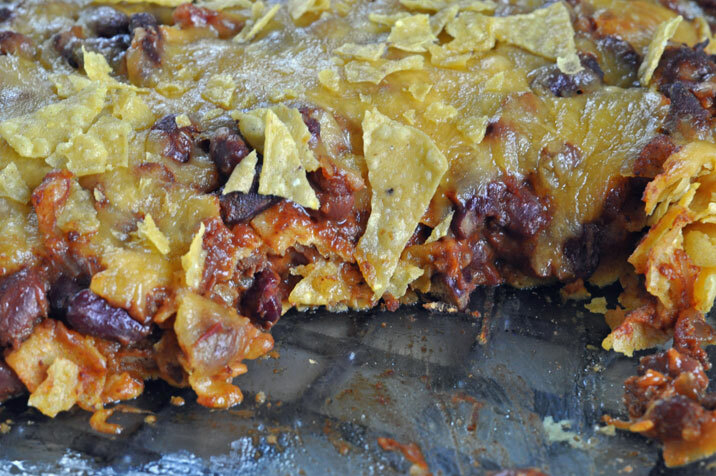 In my own casserole repertoire I use them in Pixie’s Chili Corn Chip Casserole, Mexican Lasagna, and Frito Pie. Since many times the accompanying ingredients to the tortillas/ chips are ground beef, cheese, and sour cream, the dishes are quite robust and, literally, not for the weak of heart. 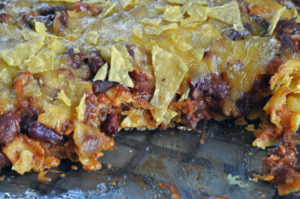 I first found out about Pixie’s Chili Corn Chip Casserole in the grocery store express lane. Pixie, the grocery checker, noticed my large purchase of Juanita’s tortilla chips and shared with me one of her family’s favorite recipes. Super easy to make with just 3 ingredients. It’s now one of our family favorites for those nights when all you can find is chili, chips and cheese. I used chicken chili, but plain old beef would work equally well. lots of cheddar cheese, grated. Spray Pam in 9x13 baking dish. Crush enough chips to generously cover the bottom of the dish. Spread 2 cans worth of chili on top of the chips. Top the chili with a thick layer of cheese. Bake at 350 degrees for thirty minutes or until casserole is thoroughly heated. Garnish with some crushed chips on top before serving. 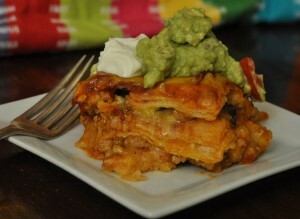 I’m sure there are many forms of Mexican Lasagna out there. This is a favorite of mine to use up excess tortillas. It’s also very easy to make; just layering the tortillas, with enchilada sauce, taco seasoned beef, green chiles, olives, fresh salsa and cheese. I like to top mine with sour cream and my guacamole. Pam a 9x13 baking dish. FYI, the beef, olives, chiles, and salsa will be divided between 2 layers. Fry ground beef up with taco seasoning per taco seasoning instructions. Spread a thin layer of enchilada sauce on the bottom of the dish. Place first layer of tortillas & coat with a thin layer of enchilada sauce. Top with layer of ground beef, olives, green chiles, fresh salsa and lots of cheese. Place a second layer of tortillas on top & coat with a thin layer of enchilada sauce. Top with a third and final layer of tortillas & coat with a thin layer of enchilada sauce. Bake at 350 degrees for about 30 minutes or until piping hot. I had read about frito pie, but never made it until a couple of years ago. Anything with fritos is bound to be good. 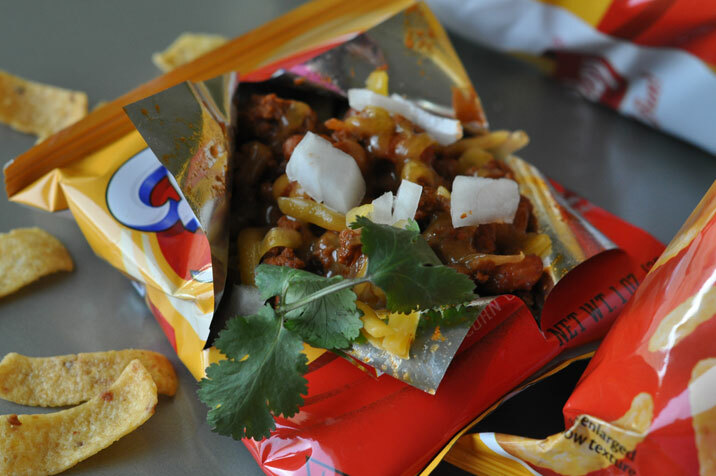 Anything served in a frito bag is even better. I used the recipe below that I found in Jane and Michael Stern’s Popular Plates Route 66 magazine, which purports to be the original. Saveur magazine has a different recipe that looks awfully good, too, which I’m hoping to try out soon. from Route 66 magazine; recipe from Mary Encinias who worked at Woolworths where New Mexicans believe frito pie was first served. Saute the bacon unti the fat is melting. Add garlic and onion and cook until the onion softens. Add the beef and cook until itis brown. Pour off excess fat if desired. Add the salt, chile powder, cumin, tomato paste and enough water to give the chili a loose but not soupy consistency. Cook for 15 minutes and then stir in the beans. Simmer until everything is hot. Divide fritos into 4 bowls. Ladle chili on top and sprinkle with cheese. Garnish with onion and jalapenos as desired.